Thousands of PALLETS IN STOCK! Pallet Renew offers a wide range of pallet related services. Our services are designed to reduce the resources our clients spend on maintaining a pallet pool, enabling our clients to better utilize those savings on revenue generating projects in their core business. We offer cost effective pallet sales, pallet recycling, pallet rentals, and client pallet maintenance and management. We constantly monitor industry standards and customer feedback in order to ensure that our services are as efficient as possible while keeping clients fully compliant with industry guidelines. Our services also offer clients a way for their businesses to be environmental stewards without increasing their costs. 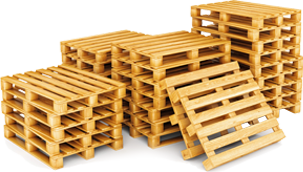 Contact us for more information on pallets. A customer service specialist is available to speak with you. Pallet Renew maintains a full stock of pallets and related specialized material handling products. No matter the size of your order, pallets will always be in stock and delivered immediately. Pallet Renew will purchase unused pallets, surplus inventory or excess pallets, at fair market value in order to free up storage space and prevent loss to your pallet pool from damage or theft. If a damaged pallet is recyclable, Pallet Renew will provide cost effective repairs that will save your business money while allowing your business to be an environmental steward. Pallet rentals allow your business to easily adapt to changing business conditions and to more easily maintain a more varied pallet pool. Find out how this service can save you time and money. Pallet Renew can receive empty pallet returns after deliveries in order to save your business on logistics costs and preserve your pallet pool. Pallet sortation, performed by experienced employees, will quickly separate damaged pallets from reusable pallets. Using a combination of products and services, Pallet Renew works with our clients to best maintain and manage each individual customer pallet production requirements. Upfront communication, consistent customer service response times and accurate documentation provide the base from which we build all our client relationships. • We have the material!